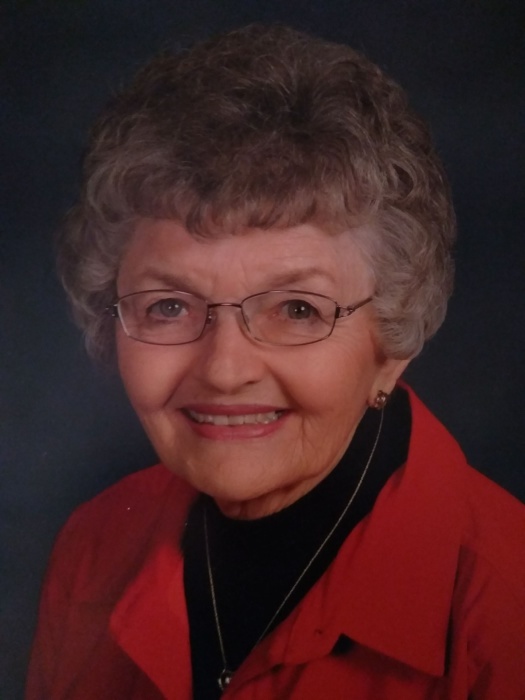 Agnes Marie Hertel Beckerdite passed on January 25, 2019, in Dodge City, Kansas. Agnes was born in Ness City, Kansas, to Alex and Margaret (Pfannensteil) Hertel. After attending high school at Sacred Heart Academy in Wichita, she received her Registered Nursing degree from St. Francis School of Nursing. During her career in health care, she worked at hospitals in Carlsbad, New Mexico, Phoenix, Arizona, Pueblo, Colorado, Dodge City and Ashland, Kansas. She married Cameron Beckerdite and moved to the B Bar Ranch 8 ½ miles south of Kingsdown on June 22, 1968. She took on Cameron’s four small daughters as her own. Cameron died November 7, 1996, and Agnes is preceded in death by her parents and seven of her eight brothers and sisters; Ed (Edmund) Hertel, Eddie (Edwin) Hertel, Wilfred Hertel, Al (Alfred) Hertel, Joe Hertel, Martina Burkhart, and Regina Dome. Her other sister, Mary Anne Dinkle still survives. She is survived by her four step daughters and their families: Ann and Howard Calloway, Claudia and Mike Terry, Camme Beckerdite and Ruthie and Neal Cox. She has nine grandchildren, ten great grandchildren, and multiple nieces and nephews.